Mark Simonson is a graphic designer and illustrator who has been developing typeface designs sporadically since the late 1970s. His first commercial releases – Felt Tip Roman, and the Kandal and Proxima Sans families – were licensed to FontHaus in the early 1990s. Of these, Felt Tip Roman has enjoyed the most success. In 2000, after a period of relative inactivity in the type design field, Mark began releasing new designs starting with Blakely, Felt Tip Senior, Refrigerator, and Coquette in 2000, continuing with Sharktooth, and Mostra in 2001. 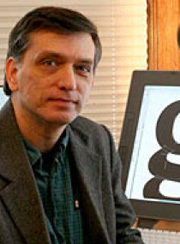 In 2003, he greatly expanded his library, releasing new family members to Blakely, Refrigerator, Sharktooth, and Felt Tip Roman, several all-new fonts, including Changeling, Goldenbook, Felt Tip Woman, Sanctuary, Metallophile Sp 8, and the new Raster series of fonts specifically designed for on-screen applications such as Flash animations and web graphics, Raster Bank and Raster Gothic Condensed.